1 leg calf raises are one of the best calf exercises for your calf muscle. You can do calf raises on 2 legs or 1 leg. Obviously, start by mastering calf raises on 2 legs and then move on to 1 leg. When you perform calf raises on one leg, you will increase the intensity and also increase the stability challenge. One leg calf raises will really work your arch muscles and the smaller muscles that support your ankles. The calfs are often neglected in workout programs, but they really support the entire lower body. Below are pictures for 1 leg calf raises. Starting Position: Simply begin by standing on the edge of a step or platform. Use your hands for light support so that you can maintain your balance, and let your heel lower towards the floor. Gently cross one leg behind the other so all your weight is on one calf. Form: Exhale and raise on to your tip toes. Hold at the top for a brief second before slowly lowering to the starting position. Personal Trainer Tips: Move in a slow and controlled manner so that momentum does not take over. Also, make sure that you use the full range of motion. The 1 leg calf raise is one of my favorite calf exercises. I know from personal experience that it can tone the calf, improve running speed, strengthen weak ankles, and improve vertical leap. 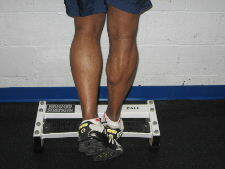 As a test, try to complete 25 repetitions of the 1 leg calf raise. When you can do 3 sets of 25 repetitions on each leg, you'll have strong calf muscles and stronger ankles.